With millions of documents still residing on microfiche there are two very important challenges in a world of smart phones and cloud computing, finding the information quickly and sending that information to the people that need it. Whether the information is stored on microfiche, aperture cards or microfilm jackets, the ST ViewScan 4’s design allows you to find and view the information quickly. Once you have the record you need, the ST Premium Software will allow you to edit, crop and share the image directly from the system. 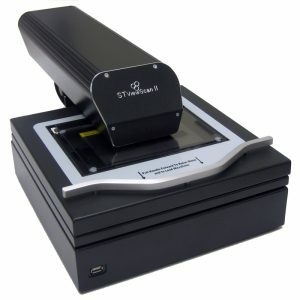 The ST ViewScan 4 has the largest, unobstructed optical viewing area of any microform scanner and the indicator light centered on the camera make it intuitive to tell where the camera is in relation to the microfiche frame. This allows the user to find the information quickly and accurately. The viewing area is so large that the ST ViewScan 4 microfiche scanner is the only digital microfiche scanner available today that is able to scan jumbofiche. Once the information is found and the image is captured, it needs to be sent to the requesting person. The operator of the ST ViewScan 4 can quickly save and share images using a variety of options which include, email, saving directly to a company server, NAS drive, DropBox and Google Drive directly from the ST Premium Software. There is no need to search and attach files located somewhere on the PC. They are all presented and easily selectable from within the St Premium Software. The ST ViewScan 4 Premium Software allows you to annotate the image by adding notes, highlighting key areas, or redacting information in addition to many more markup functions. The annotations are saved to the image so the added information travels with the image. Call us today to arrange for a demonstration of the ST ViewScan 4 system at your facility using your microfiche and see how this valuable archive can be merged into today’s electronic records.